Unfortunately the "Free MyMobileSecure with Unlimited VPN (iPhones Only)" offer is no longer available. Got a smartphone? Help protect your device at no cost. 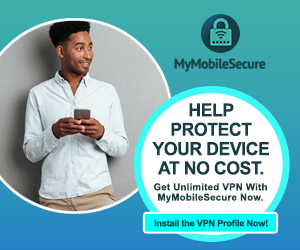 Join MyMobileSecure and get unlimited VPN! Open to 18 years and up for iPhone users who are on Safari browsers only. If not on Safari, you can still qualify by copy/ pasting the install link into Safari.